Being fit and staying fit is a blessing. A healthy diet and an active lifestyle go a long way in helping you maintain good health and physique. In spite of all the efforts, there are some parts of the body where stubborn fat might be bothering you and one such area is the lower arm region. 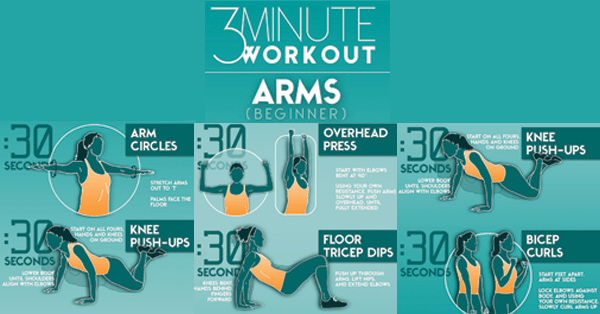 Here are some exercises that help reduce arm flab quickly and effectively. Before you start out any exercise routine at home it is wise to learn the techniques properly. Here are other main aspects to remember to make your exercises effective and safe. Do it the right way: The form is the main requisite. No matter which exercise you try from the internet, it is essential you maintain the perfect form as mentioned. Ask a friend to monitor while you do it or check for yourself by doing in front of a mirror. When your form is imperfect it can lead to unwanted strain and injuries. Focus on your breathing: Mindfully correcting your breathing is essential. Inhale and exhale at the right time and avoid holding your breath while you exercise. Holding your breath would make you more tired quickly. Stretches: Start and end your exercise routine with stretches to warm your body up and make the exercises more productive. Floor triceps dips- 30 seconds- Bend your body and lower it such that your legs are bent at the knees and your feet are flat on the ground. Ensure that your hands are behind you with the palms lying flat on the ground, fingers pointing towards the legs. Exert pressure on your arms as you rise up and lift your hips till your elbows are straight. Bicep curls- 30 seconds- Stand straight with your feet spread apart holding your hands on the sides. Fix your elbows close to your body and imagine you are holding a dumbbell and curl your fingers and bring your hands upward without moving your elbows away. This 3-minute exercise routine can build your strength if you start doing them regularly in the morning. Lunge pulses- Keep your feet wide apart one behind the other, the rear knee facing down. Stay on your toes and push your body down in a pulsating motion. Stay low and do not get all the way up. You could also place your hands on your hips. Repeat this the other side swapping your legs. Lunge step backs- In a slight squat position lunge your body while you step one foot back and then alternate the other foot. One leg remains bent while the leg that stretches back is straight while your back is straight too. Plie squats- Stand with your legs apart, chest open and belly tucked in. Stretch out both your arms forward and lunge in an effort to squat. Calf raises-With your legs spread out, keeping your knees straight lift your heels up and then lower your leg, then repeat. Step outs- These are done similar to lunge step backs except you would be stretching your legs to each side than to the back. Superman planks- From the plank position stretch your left leg outward while you raise it and simultaneously extend your right arm in front. Repeat this with your right leg and left arm. Side plank crunch- While you lie on a side plank, with your left elbow on the ground, bring your right knee upward to touch your right elbow. Repeat this on your right side. Windshield wipers- Lie flat on your back, arms extended to the sides and legs bent at 90°. Sway your legs to the left and then to the right while keeping your knees straight. Plie- This is very much similar to plie squats mentioned above for leg exercises. You stand with your feet wide apart and then bring your tailbone downward as you keep both your hands extended in the front. Touchdown- Start with half squat, with your legs close together. Extend your left leg backward with your right knee bent at right angle and your left hand stretched out in the front. Repeat this with the right leg and right hand. One leg squat- Start by standing straight, hands stretched out in the front and both the feet pointing forward. Slowly stretch your right leg to the side without bending the knee and hold for few seconds. Repeat, alternating your legs. Kick back squat- Squat with your feet flat on the ground. Extend your left foot backward till they are straightly aligned with your spine, while you extend both your arms front. Repeat this with your right foot. I’ve learn some good stuff here. Definitely value bookmarking for revisiting. I wonder how a lot effort you set to make the sort of great informative website. I do consider all of the ideas you’ve introduced for your post. They are really convincing and can certainly work. Still, the posts are very short for novices. Could you please lengthen them a little from subsequent time? Thanks for the post. Keto Supplement - Coming Soon!